With the U.S. midterm elections just six weeks away, the Sierra Club launched a campaign Tuesday to boot ten leading "Fossil Fools" from office and replace them with more environmentally friendly alternatives. The "Fossil Fools 2018" campaign, spearheaded by the group's Political Committee, targets Congressional Republicans running for reelection in November who have consistently voted in favor of fossil fuel interests and against taking action on climate change and protecting air and water. "The Fossil Fools in Congress vote day in and day out with corporate polluters instead of their constituents, allowing polluters to defile clean air and water with impunity while ignoring the climate crisis," Sierra Club Executive Director Michael Brune said in a press release. "Fortunately, voters have an opportunity to vote out the Fossil Fools in November and elect leaders who will boldly rewrite the rules of the economy so it works for our families, the middle class and our kids again." The Sierra Club said the top offenders were Texas Senator Ted Cruz, Nevada Senator Dean Heller and Florida Governor Rick Scott, who is running to represent Florida in the Senate against Democrat Bill Nelson. Cruz has a three percent environmental voting record and has taken $2,901,632 from oil and gas companies, according to the Sierra Club. Heller has a voting record of 11 percent on the environment and has taken $577,300 from oil and gas interests and $518,926 from coal mining interests. Cruz and Scott are also infamous climate change deniers. Cruz has called climate science a "religion," The Huffington Post said, and Florida's Department of Environmental Protection was banned from using the terms "climate change" and "global warming" during Scott's tenure as governor. 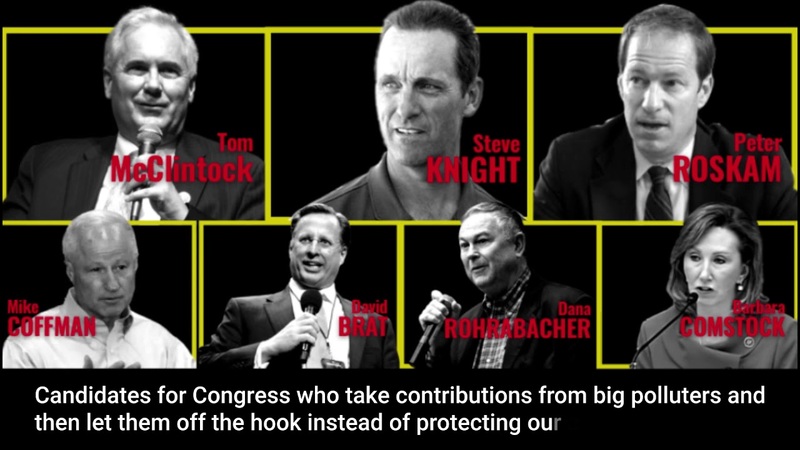 In the House of Representatives, the Sierra Club is targeting Barbara Comstock (VA-10), Dana Rohrabacher (CA-48), Tom McClintock (CA-04), Steve Knight (CA-25), David Brat (VA-07), Mike Coffman (CO-06) and Peter Roskam (IL-06). "Each of our Fossil Fools has earned that title," Brune told The Huffington Post. Brune explained the stakes of the campaign to The Huffington Post: the Trump administration is hostile to environmental action and is actively working to roll back Obama-era protections, and the Republican-controlled legislature merely enables this behavior. "Everything we've worked [for] for decades is under assault by this administration, there is no check and no accountability coming from Congress," Brune said. The campaign has started out with three video ads and will announce additional targeted ad campaigns as November approaches. The campaign will be pushed on social media and via the purchase of digital ads in the "Fossil Fool's" districts. "Our aggressive national ad campaign will let voters in key states and districts know that their members of Congress are Fossil Fools who will do anything to help polluters instead of their constituents" Sierra Club National Political Director Ariel Hayes said in the press release. "There's more to come, so stay tuned as the 2018 midterms approach."